Welcome to The Funding Crowd! And not just any Funding Crowd... the 40th Funding Crowd! Yep, if the Funding Crowd were a person, it would be entering its fifth decade of existence on this earth and start to contemplate life and how lovely two-seater sports cars really are and who cares if they have tiny impractical boots (or trunks, if you're reading this in the US of A). But no mid-life crisis for The Funding Crowd. No, sir. Instead, we celebrate in style, with a bumper issue. Two spectacular Biggies, an update on the last two weeks of funding fun, and more Gems than we know what to do with! Let's not be all depressed at how old we're feeling, let's get this party started! Now, this is a heavy one. That Dragon, Cancer is a 3D adventure game telling the story of a toddler's fight against cancer. Honoring the memory of their son Joel, Amy and Ryan Green plan to develop a game that's poetic, playful, full of imagination and of hope, despite the subject matter. The gameplay will feature no traditional puzzles. Instead, it will be more explorative, with simple environment interactions unlocking the family's thoughts and experiences. 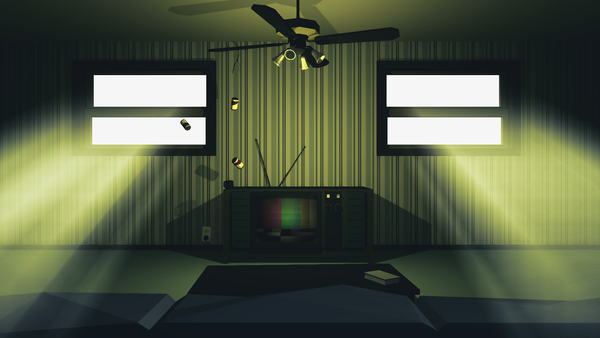 Thus, That Dragon, Cancer is supposed to be accessible to core-gamers, casual-gamers, and non-gamers alike. Ryan and Joel's alter egos in the game. With 11 days to go and more than $67k already reached, the goal of $85k seems very likely. And yes, Linux support is planned, even though the text on the Kickstarter page is a bit ambiguous. They do need some help with Linux testing, though, so please drop them a line on Twitter or using their contact form. To Azimuth by [bracket]games is another adventure game, but with a more traditional puzzle approach. Set in the late 1970s, the story revolves around two siblings in search for their brother Eli, who's been abducted by aliens. The player takes over either Susannah or Nate, looking for clues and figuring out what has happened. How deep they explore and choices they make both in and out of dialogue will shape the character and effect the outcome of the story. These choices can even be imported into a second playthrough as the other sibling, influencing how the two relate to each other. With only 16 days left on the clock and the bulk of the $20k goal still missing, it unfortunately looks bleak for To Azimuth. But maybe you can still turn it around? Another unfortunately likely doomed campaign is Late to the Party, by Unrest developers Pyrodactyl Games. This espionage RPG set in a Baltic state during the dying days of the Soviet Union has you playing a local woman groomed by the KGB to investigate your own country. You will conduct multiple investigations into the suspicious events happening in your city, their outcomes influencing the overarching plot. You will constantly juggle safety, ideology, present needs, and the needs of the future. Mechanically, the game will play similar to Pyrodactyl's previous games, Unrest and Will Fight for Food. Investigations and conflicts will primarily be resolved during dialogue with other characters. Important dialogue choices will state their intent that describes which direction that option is taking the conversation in. In addition, each character will have two attributes, Disposition and State, that describe their views towards you, coloring their reaction towards your advances. "Arre you looking for prroblems, comrrade?" As said above, funding success is unlikely. The campaign only runs for 3 more days and less than $14kCAD of the $50kCAD goal has been funded so far. The developers also realized this, and in a recent update, they already announced that this game isn't dead. It sounds like they have a backup plan ready, and even if that falls through, they're going to restart this Kickstarter campaign next year. So please, throw some money their way or at least tell other people about this game to keep the hype train going in the meantime. Sony certainly knew how to pick their "indie" game studios. The PS3 boasted two fantastic outfits that, until recently, were Sony exclusives. The first was Q-Games PixelJunk studio, which produced the marvellous Shooter game, amongst others. Of course, two of their titles have already been ported to Linux thanks to the lovely (yet controversial) people at Double Eleven. And if you haven't bought Shooter yet, do yourself a favour, pause reading this article, and pay what you want for it on IndieGameStand! The second epic Sony-exclusive developer is That Game Company, who made Flow, Flower and the wonderful Journey games. Now sadly, That Game Company don't look like they're changing their exclusivity any day soon, so it's fantastic to cover a Kickstarter project like InnerSpace which promises to capture some of the relaxed, yet emotional gameplay that we're missing out on. That Game Company pride themselves on the entire experience, creating games that are arguably more art than game - indeed Flower has just been accepted as a permanent exhibit at the Smithsonian American Art Museum. 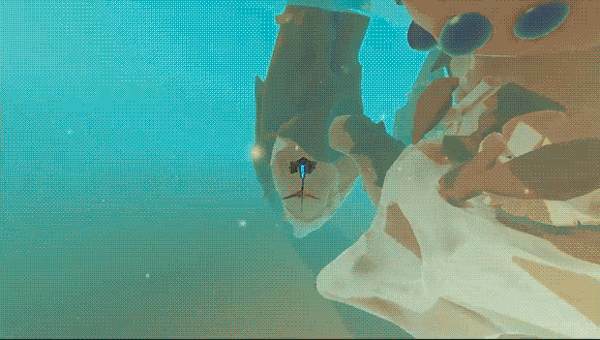 InnerSpace focuses on Flower-like flying, where exploration is the key to progress. Each level takes place in a bubble of space (an inverted sphere), ruled by a demigod and featuring multiple relics to be collected. These are then traded to a character called The Architect, resulting in upgrades to your plane and back story around the relic and how it fit into the world. The story is revealed slowly through a combination of these, building the history of this unique universe and how it came to be. PolyKnightGames actually cite classics like Shadow of the Colossus and Crimson Skies as their inspiration, but regardless of the source, what they have so far is a smooth arcade flyer in a fabulous looking environment accompanied by haunting music and an epic storyline. A visit to the studio's blog will give you a flavour of the detail they are putting into each demigod. These aren't simply bosses to be beaten and forgotten about. Instead, each will reveal how its interactions and behaviours keep the spheres intact and thriving with life. You can help push InnerSpace over the finish line in the next four days or so by pledging just $15. It will be available in about a year's time from both the Humble Store as a DRM-free download, or providing they get Greenlit, on Valve's Steam platform. Are you interested in insects? Does the way some of them behave like a hive mind fascinate you? Have you ever wanted to actually BE that hive mind? If so we've got some good news for you, as Formicarium will let you do just that, being the hive mind controlling an ant colony. If you -like this Funding Crowder- are old enough, you've probably already had a similar opportunity before with SimAnt, Maxis' third installment in their Sim series of games. However, you didn't exactly get to act as a "supreme commander" in that game as you could only control a single ant at a time and, probably due to the limitations in memory and computational power of the early 90's computers, there were many aspects of the game that completely escaped your control. Well then, Formicarium is here to change all that. It's already showing a beautifully geometrical and colourful art style, and it promises a wide variety of animal species -both prey and predator for your little ants- as well as a full genetic system in order to endow every single member of your colony with its own unique set of traits. If you look close enough, you'll see the ants. Keeping the game as realistic as possible is one of the main concerns for both the coder and the artist behind this project, and the former being a mathematician should lead us to expect a final product that's truly accurate and works like clockwork. Contrary to what you would expect, the already mentioned SimAnt was not their main influence but Dwarf Fortress and, to a lesser degree, Dungeon Keeper: the former for its huge level of detail and the latter for some of the mechanics, which are most apparent in the underground setting of the game when digging and expanding the colony. The campaign didn't start at a very strong pace and it's about to hit its midpoint with barely 25% of the goal covered. However a recent mention in RPS has resulted in the best three days pledge-wise so far, so there's still hope. There were some initial doubts about Linux support, but in the end they were cleared by the creators who will provide a Linux build to whoever pledges at the $10 level or above. If you like the project but your finances suffered so much during Black Friday that you cannot afford even such an inexpensive price maybe you'll be interested in the mobile version of the game, available to you for just $7. And if you're quick enough, there are still some discounted "early bird" slots available. Anyhow, don't forget to cast a vote their way on Greenlight if you'd like to see the game published on Steam. Ant-lovers of the world, unite and "formicate"! Let's get this right out of way nice and early. Yes, Astrojone are asking for 500,000 of something. NO, it's not dollars! Unfortunately for Astrojone, being based in Sweden is going to hurt their chances of getting their Mario-esque side-scrolling platformer Buck & Miles funded, because kr500kSEK (Swedish Krona) sounds like an awful lot, but in fact is about $65k. We can only hope that their sly use of dollar conversions on each of their pledge levels helps get the message across. Sadly, it appears to be hurting already - only a handful of backers pledging around a tenth of their total. "Under my umbrella, -ella, -ella... Aaaargh! A fire-breathing snake!!!" But there's still plenty of time! And it's so pretty! Sure, Buck looks like a burly, angry Mario and yes, the developers are aiming to release on too many platforms at once. But it's very slick looking, it features soundtracks from the same guy behind Shovel Knight and Astrojone have really done their research on that "old skool", Nintendo style of platforming that was just so much fun to play. The levels look like a cross of Mario and Sonic and the moves will feel familiar, with plenty of bum-slides, jumps and hard-to-control momentum sliding on ice. It will take just under $15 (kr110SEK) to get on board with Buck & Miles, but a word of warning. They are initially planning Windows and Mac with "high priority" to other platforms. Sadly, that list itself isn't prioritised and includes (deep breath) Linux, Android, iOS, Windows Phone, Steam, Wii U and Ouya with later consideration to ChromeOS, FirefoxOS, Blackberry and Pandora/Pyra! Their Greenlight page does tell us that Linux is one of the base platforms however, so there's hope! Yes, Your Grace is a decision based strategy game by aspiring UK developers Brave at Night. As the autocratic ruler of a medieval kingdom, Davern, you lead your people through various hardships, like famine, epidemics and war. You will have to manage resources carefully and protect your lands -- and you will have to make tough choices. The admitted influence by the bureaucratic puzzler Papers, Please is evident in the simple, yet functional interface and the the tough moral dilemmas you will face. Additionally the developer lists medieval Slavic culture, myth and legends and CDPR's The Witcher games as sources of inspiration. Behold, the Iron Thro... nope, that looks more like a dragon to me. 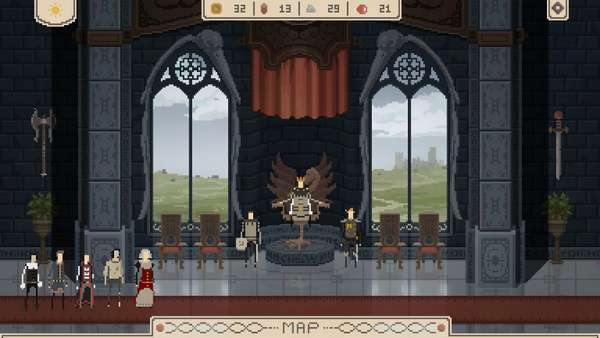 You control the game through two different screen interfaces, which can be switched between at will. Your throne room is where your peasants will seek audience to complain of their lot, and is where you'll make pronouncements and gather intel. 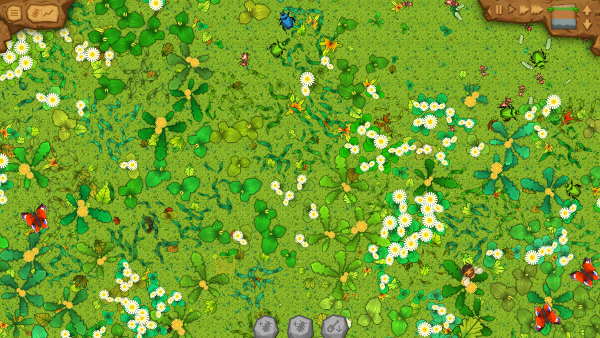 The other screen, the tactical map, is where you'll disperse your troops and manage the available resources throughout your country. You'll also have a tome at your disposal to keep track of quests and to provide information about characters and lore. With a modest goal of £6k and a quarter of it funded one week into the campaign, this one looks right on track so far. If you want to help make sure it makes it all the way to the finish line, you can get a copy on release by pledging £8 to the campaign. For those eager to get access to the game at an earlier stage, there's also the beta and alpha tiers at £20 and £50 respectively. 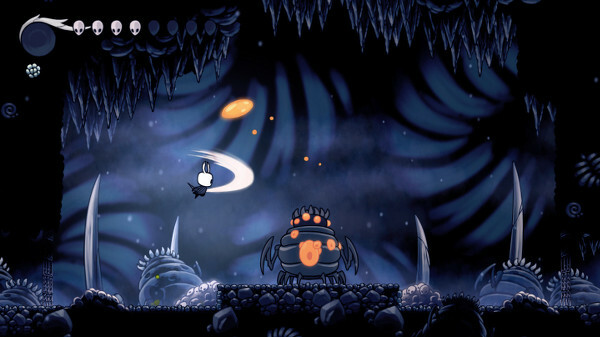 From Australian developer Team Cherry comes Kickstarter Staff Pick Hollow Knight -- an action platformer set in a vast underground kingdom of insects and heroes. It's a game brought to life with gorgeous traditional 2D animation and a grand, atmospheric soundtrack. Inspired by such classics as Metroid and Zelda II, it also has a large focus on exploration and combat; and, from the looks of it, a fluid and varied system of platforming and combat mechanics. Hollow Knight appears to follow the "metroidvania formula" closely, and on your journey through the world of Hallownest, you'll collect equipment, engage with non-player characters, fight enemies and unlock new skills. Doing so enables you to progress through the game, but also to discover secret areas, which might hide powerful artifacts. Secret areas further act as an additional challenge for more experienced players. There will also be a town where you can go to seek advice from the townsfolk and purchase items for the loot you collect. Or, alternatively, to just soak up the atmosphere. 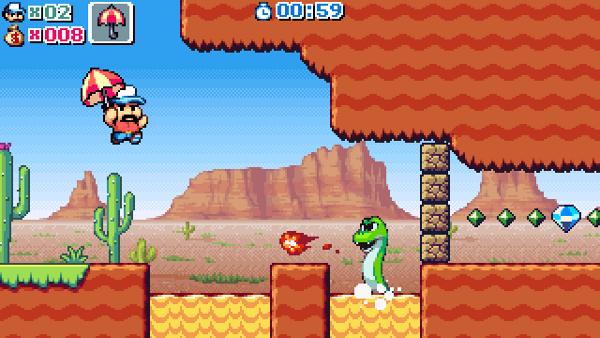 The game uses a dark and subdued color palette where spots of light and white really stand out. In doing so, it creates a setting where each scene really feels like a small and desolate place and to us it seems to emphasise a sense of loneliness in what is promised to be a great journey through a huge interconnected world. Fans of the genre would be remiss not to back this would-be gem. A mere $10AUD gives you a digital copy on release, and on Steam if it is Greenlit. The digital goodies come cheap to, as the following tiers unlock a manual, a world map and comic and, for the $45AUD tier, beta access. The game is being developed in a an engine using Haxe, so it should be a safe bet for Linux. The veterans among our readership surely know that we at TFC are true suckers for good-loking pixel art, or at least some of us are. That's why we've covered Yes, Your Grace in this same issue, and why we couldn't let something like Crossing Souls pass, as it sports the most gorgeous and HD-like (as in: arms and legs more than one pixel in width) pixely graphics we've seen in a while. Crossing Souls is, and we quote, "an action-adventure with RPG touches set in a classic 80's style". And 80's-inspired indeed it is, from its Zelda-esque 2D view to its cutscenes made to look like an 80's cartoon, including a setting and a story that could have easily been the script of a blockbuster from that decade. A group of kids on their summer vacations get to live the adventure of their lifetimes when they find a mysterious artifact that will let them travel through time as well as between different planes of reality. All in all an intrepid experience in which you'll have to switch between the five main characters and take advantage of each one's unique abilities to overcome obstacles, fight enemies, and solve puzzles in order to progress. "Aaaaaw, come on! I had just mowed the lawn!" Even the soundtrack is being composed with an 80's vibe to it, ready to bring you back to those funky years. In order to have it you'll need to fork out $30, although a digital copy of the game (presumably Steam only, as there's no word of a DRM-free option) lays only a $15 pledge away. So there you go, if you long for those youthful years and the thought of re-watching The Goonies for the 1,000th time makes you sick, go pledge and patiently start waiting for the release date, roughly estimated as late 2015, early 2016. At the time of our last issue, funding success for Aerannis was already pretty much "in the bag". The final total ended up encompassing the first 4 stretch goals, perhaps most notably including a level/mission editor. Epic Manager was also on a clear course to becoming a winner, and this status is now official. Not only did the project get funded, both proposed stretch goals were achieved: epic managers will be able to trade heroes with other adventuring agencies, and be able to order crafted equipment from the ancient alchemists who have decided to set up shop. Finally, the confident predictions by loyal backers of the HM Spiffing campaign finally came true with 2 days to spare! Thanks to generous backers who ended up pledging £44 (over $68) on average, the fine folks at BillyGoat Entertainment can stop chewing on their fingernails (and most likely other things, you know how goats are...) and get to work finishing their space adventure with a fine dollup of British humor. Override and Weather Zen are both long-shots at this point, likely due to not having gotten sufficient publicity commensurate with their fairly ambitious (by crowdfunding standards) goals. The game concepts look good in both cases, but developers without a large existing fanbase normally need to invest heavily into community-building and publicity prior to a successful Biggie campaign. Kelvin and the Infamous Machine was previously on course to follow in HM Spiffing's footsteps of victory-in-the-final-few-days, but got a welcome boost from a shout-out by a certain adventure game project appearing as one of this issue's Biggies. Now victory is almost certain, and the project looks poised to potentially reach a couple of key stretch goals during the end-campaign rush: additional translations and hopefully voice acting as well (though English only). If anyone was wondering whether there is still interest in a new point-and-click adventure that looks and plays like it could have been made in 1987, the answer is a resounding yes. 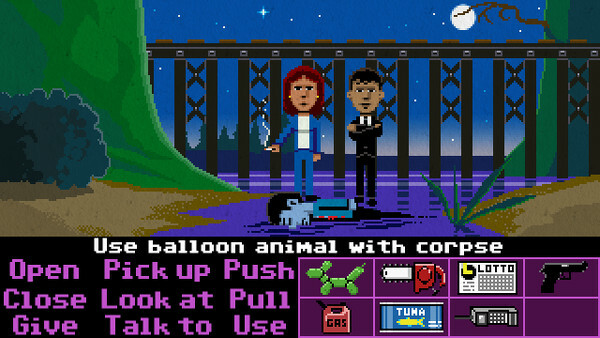 Just ask the thousands of backers who made sure Ron Gilbert and Gary Winnick's Thimbleweed Park got fully funded within a week of its launch on Kickstarter. And with the first couple of stretch goals already reached and more than two weeks to go of the campaign, it doesn't look like they're done yet. With Thimbleweed Park, LucasFilm Games veterans Gilbert and Winnick aim to deliver a spiritual sequel to their '87 classic Maniac Mansion and Gilbert's iconic Monkey Island games. It will feature five playable characters, challenging puzzles, a classic verb interface and hundreds of locations. Among those five characters are two washed-up detectives, who are called in to the desolate town of Thimbleweed Park to investigate a murder. Yes, apparently you'll be able to do things like that (or even weirder ones) in this game. For $20 you will get a DRM-free digital copy of the game on release. $50 will get your name in an in-game phone book, and a $150 pledge will get you a boxed copy of the game. At this point they're not lacking for funds, but if you want to see them reach their voice acting stretch goal at $625k, there's still a good way to go. Technically, this Canadian dollar game is a Biggie before its Kickstarter campaign even launched - it's been "out" for over two years. Lunarch Studios set up in 2010 while six MIT candidates were still pursuing their PhDs. Describing themselves as "fiercely competitive" gaming enthusiasts, they've successfully combined the best of a myriad of games, such as Magic: The Gathering, Starcraft and Hearthstone to come up with Prismata. Best of all, you don't have to take their word for it, as they've already set up a browser-based demo for you to try with no fees and no sign-in. Just browse to their site and give it a try (although we've found Chrome to work far better than Firefox for this alpha demo). 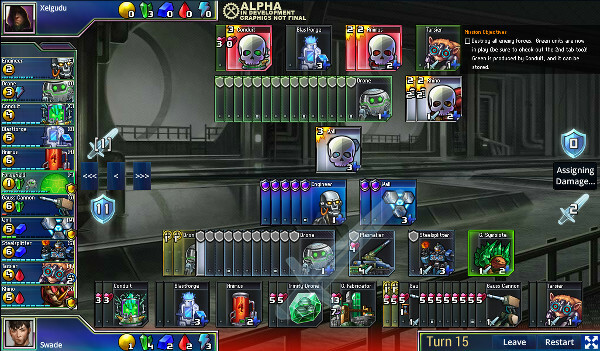 Despite the turn-based nature, games are fast-paced, lasting around 30 minutes for a drawn-out battle, but the inclusion of multiple random cards means that each battle is fresh. The twist is that although your "deck" is random, it's the same as your opponent's, so strategy, not luck is the decider here. And that's a key point, because Prismata is in the challenging position of trying to raise $140kCAD for what will effectively be a free-to-play game. So basing the game on strategy is key because it forced Lunarch Studios into an early decision that not only will Prismata NOT be pay-to-win, but it as it puts it so succinctly, it won't "monetise frustration" either. So there won't be any paying for lives, nor paying to reduce timers. So what are you paying for, by backing this campaign? Well, Lunarch have come up with a variety of interesting schemes. The most obvious is borrowed from DOTA2 - you can buy new skins for your key deck units, such as the Drone, or the Engineer. At slightly higher tiers, you will unlock bonus side-missions which can be played alongside the single-player campaign. Then there are puzzle challenges, custom avatars, or lobby badges. Which is a good thing, because this game is dangerously addictive. True, it perhaps takes a particular style of gamer to fall in love with Prismata, but if you have a background in table-top gaming, card gaming or old-school strategy video games, then you might very well find yourself in that category. We suggest you try the demo and find out first hand. A battle in all its splendor. The long term goal for this Biggie is to make Prismata a competitor in the e-sports world. To that end, Lunarch Studios are building in ladders, ranking games, replays, integrated Twitch streaming, social features and local observer modes so that big tourneys can run an event confidently. Online matches not your thing? Well you can still enjoy around 40 single-player missions against an AI programmed by the very man behind the 2013 StarCraft AI Competition, who AI defeated all other teams' entries. Pledges start at around $17CAD for early bird, of which very few remain. After that, the supporter pledge is $22CAD, granting you continuing Alpha access as the game develops - it's not clear if the demo link will be taken down when the Kickstarter campaign ends, but even if not, it's not going to be updated, so if you like what you see, this will keep you playing. And we're not even done yet! Incredibly, despite the frankly epic number of Biggies and Gems we covered this time around, a couple of projects sadly just ran out of time to get the proper research and write up. 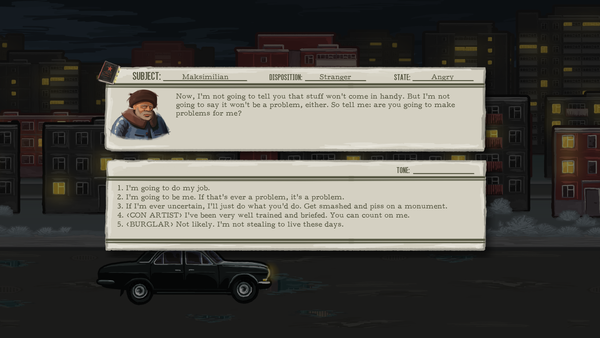 So if you're hankering for more, may we suggest that you check out Devil's Bluff, a retro-themed online murder-mystery adventure. As genres go, you have to admit that this is probably a first! 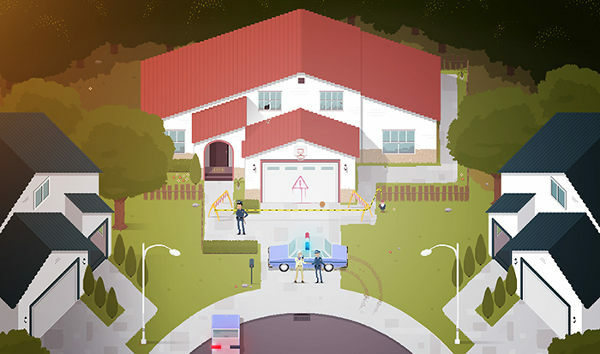 We also couldn't cover Désiré which is a more traditional point-and-click adventure game, but featuring a new cross-platform engine with WYSIWYG editor. Still not satisfied? Fear not! There's more! We will close with a bonus tip possibly of interest to all you German-speaking backers of Torment: Tides of Numenera out there -- a crowdfunded pen-and-paper Numenera translation project which promises to collaborate with the Tides of Numenera translation team to make sure key terms are consistently translated. And there we have it. We may have joked last issue about "quality, not quantity", but this time around, we like to think that we've delivered a bit of both. Please PM one of the team: (scaine, Speedster, muntdefems, flesk, or new recruit DrMcCoy) if you think you can help or just want to chat about Crowdfunding! And of course, remember that you can use the comments, Wiki, forums, or direct messages (PMs) to keep us up updated on any suggestions that you'd like to see covered. So why are you still reading?! Get your wallets out and go get pledging... these games aren't going to make themselves! I didn't really know how to feel about HM Spiffing. It was a game which - in theory - I would enjoy greatly. But then at the same time I was just hugely put off by that ugly nationalism I've grown so sick of over the last 2 years. Even if it was meant ironically (which I assume it was) I get more annoyed by the fact that many people won't see that and think that the British Empire (and the genocide of millions) represent some sort of nostalgic "glory days" which can be looked back upon in pride. So even though it looks like a solid adventure game, just couldn't bring myself to back it. It's a bloody disgrace it hasn't already exceeded its goal, especially when something like Thimbleweed Park is currently on track for almost a million. As a hint, the title of the developer's homepage is "Billy Goat Entertainment Ltd | satirical animation, not for the sheepish". However, I can understand why someone would not be able to enjoy satire on a sensitive topic -- some people find comedy helps them cope better, but others might find it too painful. The $50 phone book tier now includes voice mail. will be included in the game - after approval. Speedster As a hint, the title of the developer's homepage is "Billy Goat Entertainment Ltd | satirical animation, not for the sheepish". However, I can understand why someone would not be able to enjoy satire on a sensitive topic -- some people find comedy helps them cope better, but others might find it too painful. No, that's not really the problem. Effective satire picks apart what it's ridiculing and often tears it to shreds. This doesn't really have that feel, it feels more like that "oh look how outrageous we are with our queens and empires, but nonetheless proud" like a bad High Grant film. Personal preferences I guess. Kelvin and the Infamous Machine did reach base funding level today, onwards to stretch goals! InnerSpace is the one I'm most excited about at the moment. It's not going to go much above its funding goal, but I feel like it's achievable. There aren't enough flying/exploration oriented games around these days. Yeah, there's an interesting dynamic at work. I don't think I've seen a game campaign fall shy of its goal by less than a couple of thousand, so at this point it feels guaranteed. Innerspace now founded! Yaaaaas! Excited for that one. I fell in love with it as I was writing it up. So mellow. So beautiful. Prismata closing in on $100k too, so fingers crossed there. Trend looks solid. And Thimbleweed finally looks to be slowing down slightly. Aiming for the half-million I think, although the trend puts it over $750k!!! Surely it can't hope to keep that kind of momentum going! ?